I’ve always thought reversible skirts were a brilliant idea, especially retro swing skirts! There’s not many around (the only other one I know of is the Glamour Bunny taffeta one) but I was excited to try the Pink Lemonade Retroversible Skirt from Julie Mollo! I tend to go through phases with separates- sometimes I can’t be bothered with them and stick to dresses but right now I’m loving expanding my fairly small collection of skirts and tops. Pink and yellow are both favourite colours of mine so this skirt was a match made in heaven! The issue I can sometimes find with skirts/tops is that I’m not one for print clashing so I need at least one half of the outfit to be a plain solid colour if the other half has some sort of pattern. This skirt has a perfect shade of bubblegum pink on one side and bright sunny yellow on the other so I can choose to wear either a solid colour on top or something with a little more detail. Easy as pie to match! The skirt is made out of a light cotton and has a gold reversible zip down the back and then a small tie at the waistband. I have a 27″ waist so I am between the small and medium sizes. This is a medium and is a little big so I put the belt on to help cinch it in. I find the tie at the top a little bulky and would have preferred a button closure to make wearing belts over the top a little easier. For some, the zip right the way down the back might be annoying but I’m one of those people that if I can’t see it, it doesn’t bother me and at least it’s a pretty gold zip! The only other small issue to know about is that on the yellow side, the white designers tag is sewn to the waistband so it would be seen if you were wearing it without a belt. Again though, it’s at the back so potentially not bothersome to some. These small little things are not major enough to put me off wearing this skirt or recommending it to those of you who love the idea of two skirts in one! At the reasonably high price of US$150, it’s quite a bit of money to spend on a skirt BUT this is no ordinary skirt and fabulously versatile. If pink and yellow isn’t your thing, there a few other choices like Denim/Blue Tartan, Solid Black/Red Tartan, Gold/Silver (a favourite of mine!) and Sky Blue/Crisp White. I paired the Retroreversible Skirt with the Pinup Girl Clothing Peasant Top (full review also coming!) and belt, BAIT Footwear Betty Heels, Vivien Of Holloway Petticoat, The Crave Yard Brooch, Orchids from The Sophisticated Lady and vintage bangles. This is the perfect summer skirt and makes me dream of warm sunny weather- still months and months away for us in the Southern Hemisphere entering the depths of winter! Thank you so much to Elizabeth J Photography for the gorgeous set of photos and dreamy lighting. 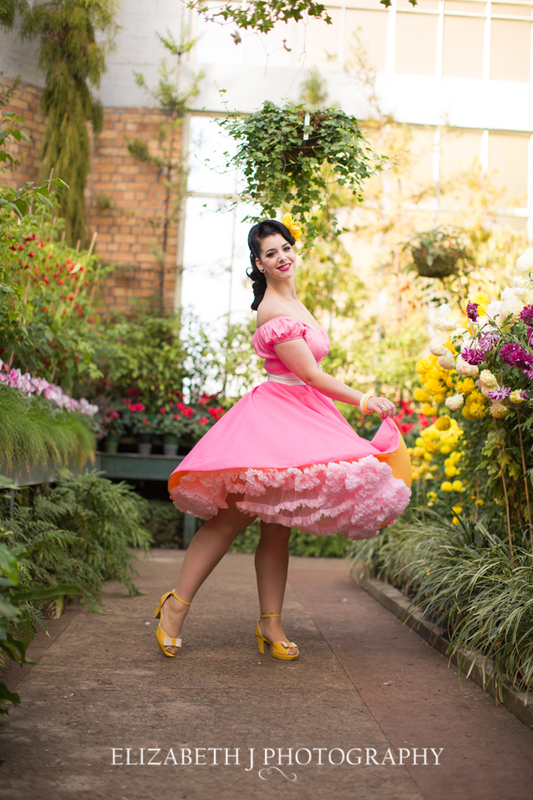 I just happened to perfectly match the flowers in the Auckland Winter Gardens! Stay tuned for more from this shoot in coming weeks, I’ll be featuring lots of separates including pieces from Pinup Girl Clothing, The Oblong Box Shop and Fables by Barrie! This look amazing – I love the colours! Such a neat idea. What a splendidly pretty, cheerful, awesome skirt and whole outfit. You look as gorgeous as the return of summertime itself, my dear!